Japan’s Hottest Street Racing is Coming to LA: Mario Kart Live! We’ve all seen it. 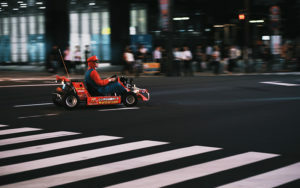 The live Mario Kart street races that legally take place in Tokyo Japan. You can even dress up as your favorite character and let it rip. Well now this pop culture phenomenon is coming to LA. Usually if you tell an Angeleno they have to spend more time in a car you’ll see them turn tail and run for the hills. This is one exception to that rule. A Mario Kart Car you say? We’re in. We’re double in if it makes this happen any sooner. Maybe you’re a fan of either the OG Super Mario Kart or Mario Kart 64, which is permissible because respecting your elders is cool, or you’re into Game Cube’s Double Dash version. Or maybe you spent years of your life mastering Kart for Wii or like, the Nintendo Switch, because, I don’t know, you’re a champion. In any case, all you’ve been working towards is about to become a reality! We challenge anyone to deny that they’ve dreamt of participating in a real-life version of Mario Kart. And they said Ready Player One was just a movie. You see this magical madness which is sweeping the nation? Gamers rejoice! Our moment is upon us. Your ticket—cost as yet undetermined—includes 30 minutes of racing and a costume. TAKE OUR ENTIRE BANK ACCOUNT! WE’RE READY!! 2019 is shaping up to be glorious for the nerdom. Dragons ala Khaleesi will be back, and live Mario Kart will be ripping through our lives, in real life.